Every once in a while we like to get out of the city, far away from the hustle and bustle. We tend to go a bit further than most. 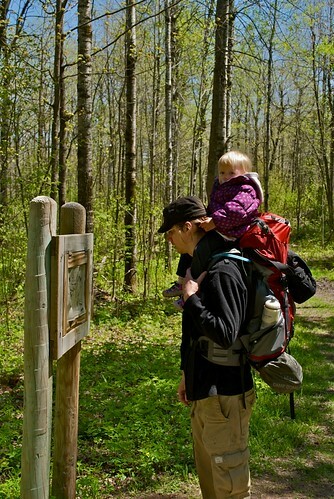 With everything we need strapped to our backs, we head a few miles into the woods to really get away. 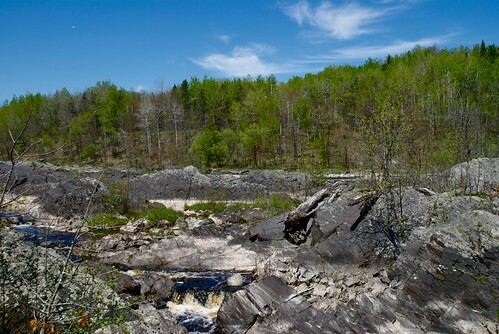 We began our trek into Jay Cook State Park, just west of Duluth, Minnesota and south of the Thomson Reservoir, a powerhouse that expands 3 miles outward. It was quite a site as we prepared to pack as little supplies necessary for ourselves and our daughter. We started out with a full carload of supplies and narrowed our necessities down to two night packs. 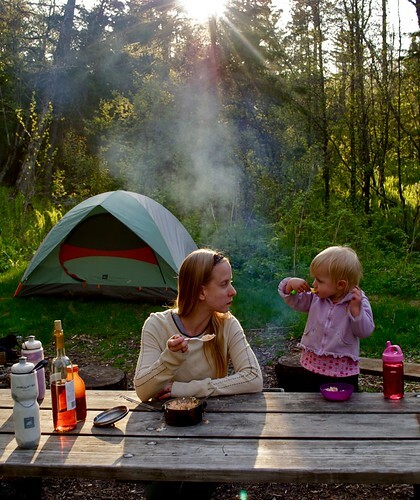 Having our daughter along for the hike appeared to present challenges to a ranger on duty, who offered us a closer, more convenient site to camp at. We were confident we could hike the two miles, regardless. Accumulating the gear for trips like this can take awhile. 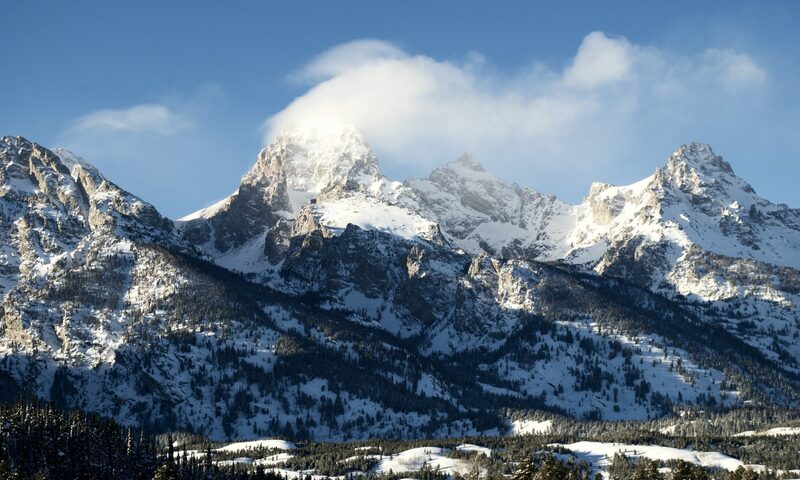 Zach bought a tent and backpack from REI last summer for our trip into the Sawtooth mountains and Sarah just picked up a new pack from Outdoor Outlet last week. Zach’s pack weighs 4 lbs. 4 oz. and holds 65 liters while Sarah’s pack holds 48 liters and is 3 lbs. 6 oz. 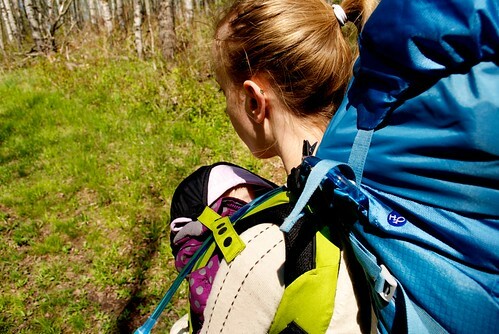 The bulk of both packs are taken up by a pair of low priced 3 lb sleeping bags (the next thing on the list to replace). The Tent weighs in at 4 lbs. 15 oz. and Zach has a 7 oz. therm-a-rest pillow that compacts down to save space while Sarah uses a pillow case full of clothes. To make sleeping a bit more comfortable, Zach just picked up a sleeping pad that only weighs 1.5 lbs. For those times when a fire doesn’t work for cooking, ie during the hike or if weather doesn’t permit, Zach has a little stove, pot, and silverware. Both packs hold a 2 liter water reservoir and have a slot on either side to make the straw readily available. We generally carry an extra water bottle or two for cooking and one for Jada. 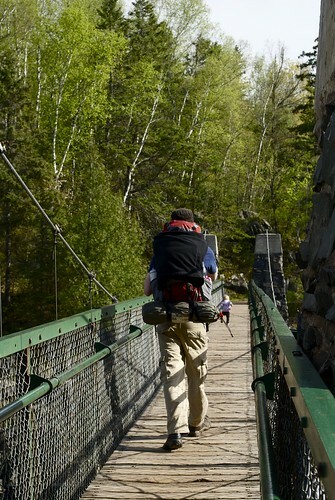 Add some extra clothes, food, a first-aid kit, and our camera to round out each load at about 25 lbs. The duty of carrying a 30+ lb. girl after she could no longer walk on her own was shared between the two of us, either on Zach’s shoulders or in a carrier on Sarah’s belly. 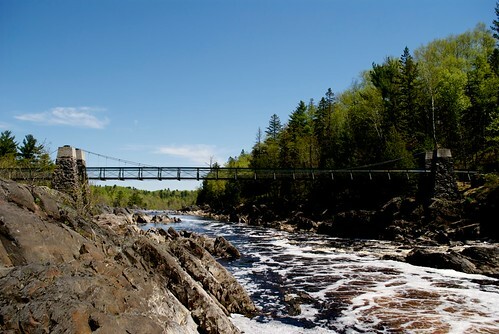 The trail to the backcountry campsite led us down a newly paved path to a long bridge that swings nearly 40′ above the crashing tidal waters of the St. Louis River. As we crossed the swinging bridge, we began hiking up rolling hills that crossed paths with various life forms. Among many trees were the box elder, quaking aspen, and black ash. The sites and scents of the abundant wildflowers were a great pleasure. Jada, our daughter enjoyed picking the brightly colored flowers in amazement along the way. The columbine wildflower is an attractive blossom that occurs in May-June, it’s nectar is known to attract various hummingbirds. During the hike we often caught eye of a symbol of happiness, the eastern bluebird. This we certainly experienced in fullness. 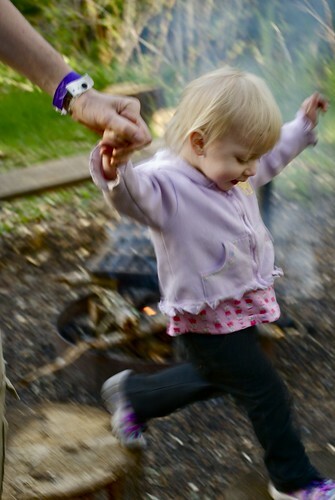 By far this was the furthest our 1 1/2 year old daughter Jada had ever hiked. She soon tired out and fell asleep, cradled in our arms. Once we arrived at our destination, Silver Creek, she woke up from her peaceful slumber. 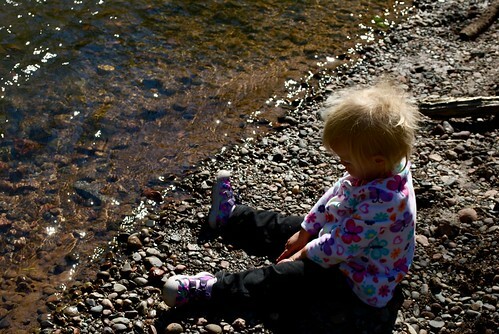 She then proceded to turn the campsite into a Jungle Gym as there were planks of wood laid across stumps to form benches, a natural born gymnest 🙂 She also found the creek entertaining, making it her mission to throw every pebble into the water to watch it splash. Waiting for us at the site was a stack of firewood, so we were saved from having to gather some ourselves. With a fire going we heated up the chili and rice that we had brought with and opened a bottle of wine. We had brought just enough to eat so we didn’t weigh down our packs. We also chose to finish the wine so we could lighten the load for the trip back. The creek nearby provided the perfect soundtrack to fall asleep. After we had all laid down Jada proceeded to tell us a tale with great enthusiasm. We figured that she was telling us all about everything she had seen and how much fun she was having. She eventually wound down and only woke up once when she was hungry for some milk. Zach got up out of the tent to bring the fire back to life to heat it up and found that the Sky was full of stars, so he stayed up a bit to stare through the trees into the big open sky. The morning sun came invitingly to light up our camp. It was as beautiful when we opened our eyes as when we closed them. It felt cool so we bundled up. 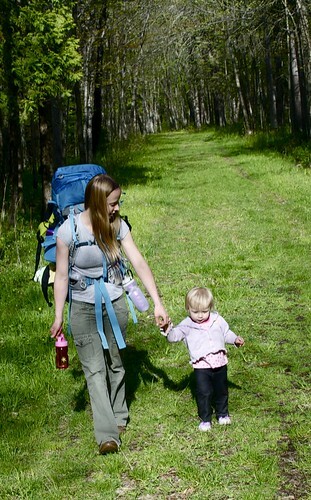 We packed our belongings and hiked the Silver Creek Trail that continued alongside the St. Louis River. Slate formed from compressed mud that has been hardened over two billion years, folded into unique formations that feel smooth and intricate to the touch, guided the downstream flow of the river. There were many rocks to carefully maneuver across as we hiked closer to the shore of the river. Jada enjoyed traveling on her Daddy’s shoulders and quickly learned how to grab nearby leaves as she was much taller now. Zach had used a variety of foot techniques as he balanced his stance to cross the changing terrain. Greywacke beds became visible with its fractures. Red clay overlies the bedrock as remnants from the end of the Ice Age that was ten thousand years ago. The hike was beautiful and was definitely a workout. On the first day we missed a turn to hike an extra half mile or so and the second day we wanted a more scenic route so we hiked nearly an extra mile. When it was all said and done we went 5-6 miles. It was great when we were near the end Sarah was wondering how far we had to go, and I said see the bridge right there, her eyes lit up as it had magically appeared before her eyes.